Chandrashekhar Mahakalkar, Meghali Kaple, Niket Jain, Parag Jaipuria, Dhirendra Wagh, Prateek Laddha. Background: Patient satisfaction is an important measure as it is a primary means of measuring the effectiveness of health-care delivery and success of health-care facility. Objective: To evaluate the satisfaction level of the patients admitted in surgical wards. 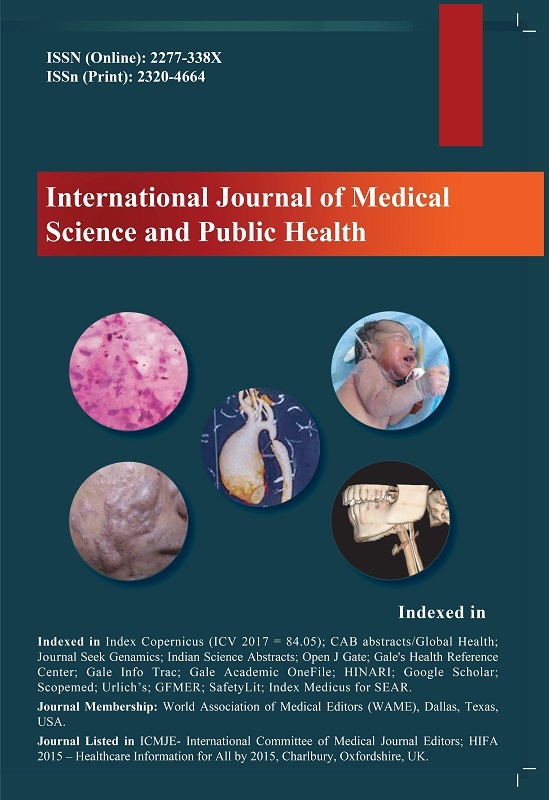 Materials and Method: It was a hospital-based cross-sectional questionnaire based study carried out at Acharya Vinoba Bhave Rural Hospital (AVBRH), Sawangi (Meghe), Wardha, Maharashtra, India. The study was conducted from February 2014 to May 2014 among the patients admitted in surgical wards of AVBRH with a minimum hospital stay of 2 days. The study was conducted for 4 months involving 210 patients. Results: The total number of patients involved in the study was 210 and male-to-female ratio was 2.6:1. The mean satisfaction level for admissions and discharge services was 130 ± 28.80104 (SE = 12.88022) and it was statistically significant (p = 0.00148). The mean satisfaction level for physician services was 128.50 ± 30.94484 (SE = 15.47242) and for nursing services was 95.3333 ± 16.16581 (SE = 9.33333). The overall level of satisfaction (75.24%) was good. Conclusion: Assessments of patient satisfaction and evaluation of the factors for dissatisfaction are relevant to strengthen the bonding between the health-care facility and the faith of a community. The cost effectiveness of the services provided would also go a long way to maintain the bond between the doctor and the patient for the achievement of the optimal level of health of the people. 2. World Health Organization. The World Health Report 2000. Health Systems: Improving Performance. Geneva 2000. 4. Singh S, Kaur P, Rochwani R. Patient satisfaction levels in a tertiary care medical college hospital in Punjab, North India. Int J Res Dev Health 2013;1(4):172-82. 6. Agrawal D. Health sector reforms: relevance in India. Indian J Community Med 2006;31:220-22. 8. Sreenivas T, Prasad G. Patient satisfaction: a comparative study. J Acad Hosp Adm 2003;15(2):7-12. 9. Kumar R. Medical documentation: patient satisfaction document. J Acad Hosp Adm 2003;15(1):1-6. 10. Bhattacharya A, Menon, P, Koushal V, Rao KLN. Study of patient satisfaction in a Tertiary referral hospital. J Acad Hosp Adm 2003;15(1):1-6. 11. Singh B, Sarma RK, Sharma DK, Singh V, Aryaand SD. Assessment of hospital services by consumers: a study from NDDTC, AIIMS, Ghaziabad. Medico Legal Update 2005; 5(1):1-3. 12. Kulkarni MV, Dasgupta S, Deoke AR, Nayse, Study of satisfaction of patients admitted in a tertiary care hospital in Nagpur. Nat J Com Med 2011;2:37-9. 17. Rosenberg J. Health administrators go shopping for new hospital designs.Â Nat Rev Med 2004;1(21). 18. Qureshi W, Khan N, Naik A. A case study on patient satisfaction in SMHS hospital, Srinagar. Jammu Kashmir Practitioner 2005;12(3):154-5. 19. Abdosh B. The quality of hospital services in eastern Ethiopia: patientÂ’s perspective. Ethiopian J Health Dev 2006;20(3): 199-200. 20. Jawahar SK. A study on out patient satisfaction at a super specialty hospital in India. Internet J Med Update 2007; 2(2):13-7.